Oh we do like to be beside the seaside, so for a summer holiday that’s full of play, a heady dash of bright colours and a hint of Scandinavian traditional dress, look to Swedish childrenswear experts Polarn O. Pyret. At PO.P you’ll find children’s clothes and accessories in strong, beautiful and playful colours, with fabrics and designs that mix and match just as well as a bucket and spade. From fairytale toadstool and ladybird prints to traditional style Swedish embroideries and ginghams, there’s a lot to tempt this season. And because the cotton in PO.P’s range is so hardwearing, there’ll be plenty of time for your children to wear the clothes, then just pass them on to little brothers, sisters and friends. In fact on ebay in PO.P’s native Sweden, second hand clothes from the 70’s ranges still fetch a high price, as people buy them for their ‘retro cool’ factor, as well as their tough quality and enduring styles. PO.P’s summer fabrics will also help keep your children cool in the warmer weather, with natural cottons and linens featuring prominently in all collections. 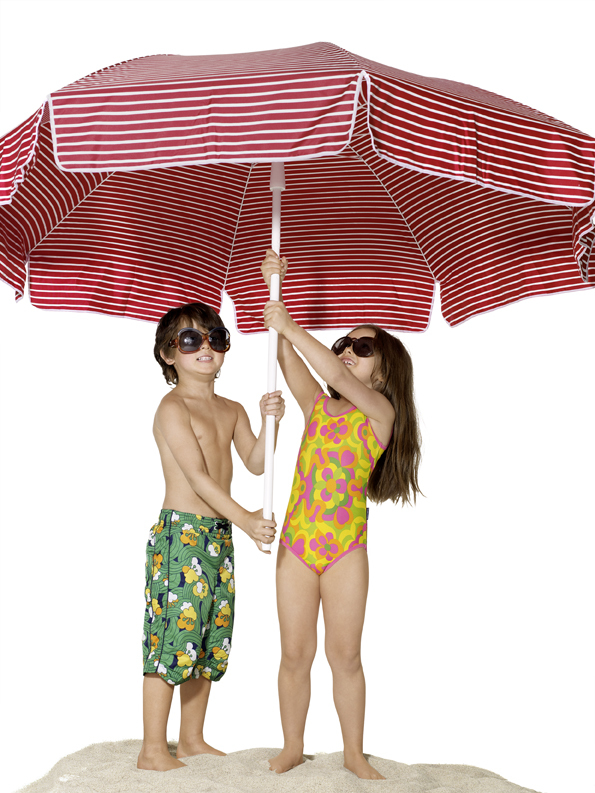 From PO.P’s eco cottons for its newborn range, to sunwear that offers the strongest protection against harmful UV rays, PO.P continues to look for the best ways to keep both kids and parents happy when temperatures rise outside. PO.P’s philosophy is all about ‘letting children be children’, so all items are produced with this in mind – PO.P’s focus is on quality, function and design. Many of PO.P’s designs have a distinctively unisex feel, and are featured in the store as a ‘Uni’ offer. Rather than fitting into gender stereotypes - jeans and tops have been designed to suit both boys and girls, and to co-ordinate with jackets, skirts, socks, and hats. So it’s pink trims for boys and blue flowers for all, to ensure you get the most for your money this year. PO.P can be found in House of Fraser stores in Oxford Street, London (0-8 years), Manchester (0-8 years), Jenners Edinburgh (0-8 years) and Norwich (0-8 years) and Belfast (0-8) years. There are four large high street stores with the full range of 0 – 11 years and Maternity, in Windsor, Derby, Cambridge and Brent Cross Shopping Centre London NW4. Four new Polarn O. Pyret stores are planned this year for the UK, including Kingston Upon Thames for June. You can also log on to www.polarnopyret.com and call 01753 622233 to order over the phone. •	Polarn O. Pyret dominates the Swedish children’s wear market with 55 stores across the country, making it Sweden’s leading store concept for children’s clothing for quality-conscious parents and families. •	Polarn O. Pyret has regularly won prestigious awards including: Swedish Chain of the Year; Best Store Concept; Best Franchise Concept and the Sweden Power Brands Awards. •	In the last 3 years Polarn O. Pyret has doubled its number of stores in Europe to over 100 and is now available in 11 countries. •	Polarn O. Pyret is owned by Swedish company, RNB Retail and Brands (RNB), which is the 4th largest retailer in Sweden. •	Odin Retail is the master franchise partner in the UK and Eire. This press release was distributed by ResponseSource Press Release Wire on behalf of Sweet Marketing in the following categories: Children & Teenagers, Women's Interest & Beauty, Retail & Fashion, for more information visit https://pressreleasewire.responsesource.com/about.